This was a fantastically satisfying day! 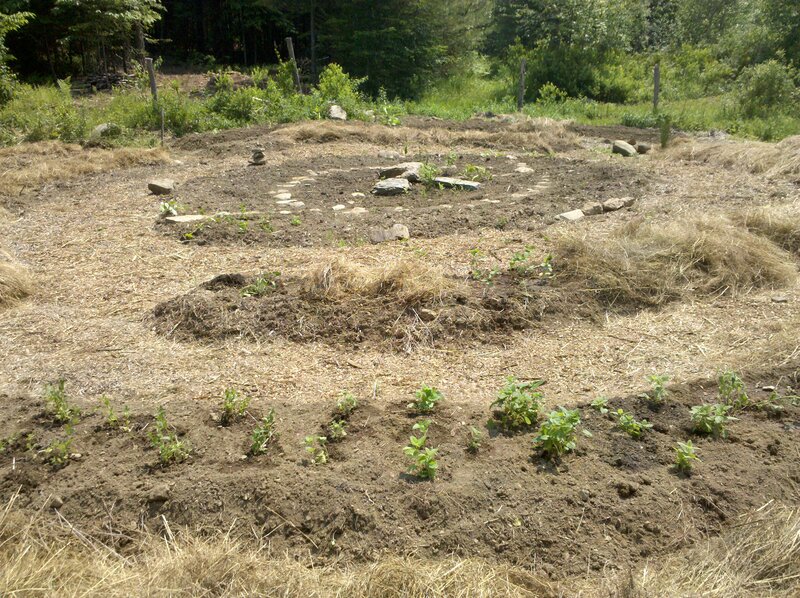 We had a smaller crew because of Memorial Day, but we were no less productive.We laid stone paths in our central circle and planted a few foundation plants–holly hocks, meadowsweet and sweet cicely–among the 3 center stones. We also put lady’s mantle and a few violets and violas in. We had my mom’s help, too–she was hot on the trail of the pernicious bindweed, and made sure our stone paths were good and sturdy. Everyone also got a good glimpse of how I became a plant geek! We had thought a lot about the paths in the center and had originally been planning 4 paths aligned with the compass, but in the end, it seemed a more organic, sinuous design wanted to emerge. It ended up looking a little like a yin-yang, with an extra squiggle, appropriate for this garden. We also got a fair number of plants in the ground, too: many of our nervines, such as wood betony, catnip, blue vervain, motherwort, anise hyssop, peppermint and more lemon balm and skullcap; the beginnings of our lung bed, including angelica, elecampane and marshmallow; and then good beds full of echinacea, black cohosh and valerian. We are so grateful for the many mature transplants we received from friends–what a difference it makes to have happy, established perennials. We have many of the same plants coming along in the green house as seedlings, but we like having older “role models” for them to look up to.